Mofongo, I love the word. It’s pronounced just like it’s spelled. A popular Caribbean dish but undoubtedly of African origin. Basic mofongo is simply a mixture of crushed plantains with fried pork crackling served with a sauce. 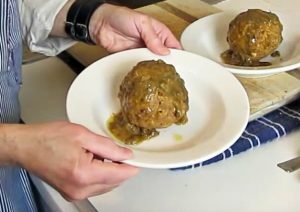 In the Puerto Rican version, we prepare it as individually shaped mofongo balls, similar to meatballs. Cuban mofongo differs in that the mixture is shaped into one large ball which is served in a bowl. More modern variations have this type of mofongo stuffed with beef or seafood. Whatever method you prefer, it is a delicious appetizer, side dish, or meal on its own. Peel plantains and cut into diagonal slices about 1-inch thick. Place plantains and diced salt pork in a pot with water to cover. Let soak for 10 minutes. Drain and wipe dry both plantains and salt pork. Place salt pork in a hot skillet or frying pan (no extra oil is necessary). Stir-fry over high heat until pieces are browned and crisp (about 5 minutes) and put aside. This is known as the chicharrón or pork crackling. Deep fry plantains in hot oil until golden. Drain well on paper towels. Crush plantains and pork crackling together in a mortar. This may have to be done in batches depending on size of mortar. Place in a bowl and set aside. Crush garlic cloves in the mortar. Blend in olive oil. Add garlic-olive seasoning to the plantains and crackling and mix thoroughly. Scoop up a tablespoon of the mixture and shape into a ball (about 2-inches in diameter, or large if desired). Repeat until mix is used up. Serve by itself or with favorite sauce or gravy. Yield: 12 or more mofongo balls.